Leonardo takes the modified Triceraton aircar out to investigate the bat mutants. 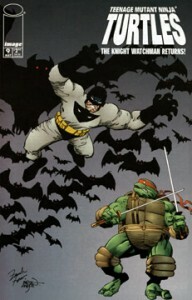 As he’s flying, the ninja (literally) runs into a man bat that attacks him. The battle leads to an alley, where Leonardo finally gets the upper hand and prepares to stake the creature when his armed is grabbed by the Knight Watchman, a famous superhero. The Watchman tells Leo that killing the beast is unnecessary and asks the Turtle to hold the bat man while he administers an antidote. The hero tells Leo that the Mutagen is apparently reacting to the rabies virus and causing people to mutate into these monsters – but fortunately the rabies treatment cures the victims and returns them to their normal selves. The Watchman gives the bat creature a shot and then punches it in the face, knocking it out cold (to give the serum time to take effect). The Knight Watchman tells Leonardo that ever since his associates had discovered mutagen in the blood of the bat men, he had been trying to contact the Turtles and Splinter. Leo explains that Splinter was given another dose of mutagen and then he walked through a cave full of bats, which must be why he transformed into a bat and how he became exposed to rabies. The pair return to the aircar, only to find it completely stripped of parts by bandits! Leonardo heads back to the Knight Watchman’s mansion. We discover that thje superhero’s real name is Jerry Randall, and he’s the nephew of the original Night Watchman. Jerry has been a virtuous superhero going by the name of Galahad, but lately he’s found the Knight Watchman’s reputation as a loose cannon beneficial to his efforts, as criminals fear the Watchman. Jerry states that he doesn’t know which approach is more effective, but he enjoys playing both “good cop” and “bad cop” roles. Leonardo tells Randall that he can attempt to contact Splinter via astral projection, so the pair retire to the libray where Leo meditates and Jerry contemplates their situation. Hours pass by and dawn approaches when suddenly a bat man crashes through the windows, being followed by hundreds of normal bats. The monster spies Leo sitting in the lotus pose and announces that this is the one the Master seeks as it approaches the ninja. The Watchman sets off a flash bomb that blinds the bat man, allowing the superhero to grab him. Just then the other bat mutant awakes and runs to the window – Jerry yells a warning but it’s too late, and the beast leaps out. Unfortunately for him, the bat mutant changes back into its former human self in mid-air and begins to fall. Fortunately, Leo has awakened from his trance and lassos the man’s leg before he falls to his death. The Turtle then explains that he was able to contact Splinter, but he’s confused and out of his mind with pain caused by the rabies, thus his location remains unknown. Randall grabs the other bat mutant to find out where Splinter is, but it eludes his grasp and escapes. Later, Leo and the Knight Watchman are driving to a nearby abandoned mine. We discover that Randall had intended the bat creature to esacape, as he planted a tracking device on it. They move into the structure and find two dozen bat man hanging from the ceiling. Master Splinter awakens and calls out for his minions to attack. The Watchman tosses some grenades that explode, releasing a new form of the rabies antidote into the room. This new cure works almost instantly, and the bat creatures return to their human forms. Unfortunately it doesn’t have the same effect on Master Splinter, who attempts to escape. Leonardo jumps onto his Master’s back and sticks him with a needle, injecting the cure… but it doesn’t take quick effect and Leo is bucked off. Master Splinter flies off, much to Leonardo’s dismay.